Crafted in a stretchy waffle fabric, this long-sleeved and figure-flattering dress has just enough flow and movement. We added asymmetrical seams for a little edge that’s still office appropriate. Made in NYC. Final sale. A-line silhouette with long sleeves and figure elongating asymmetric seams. 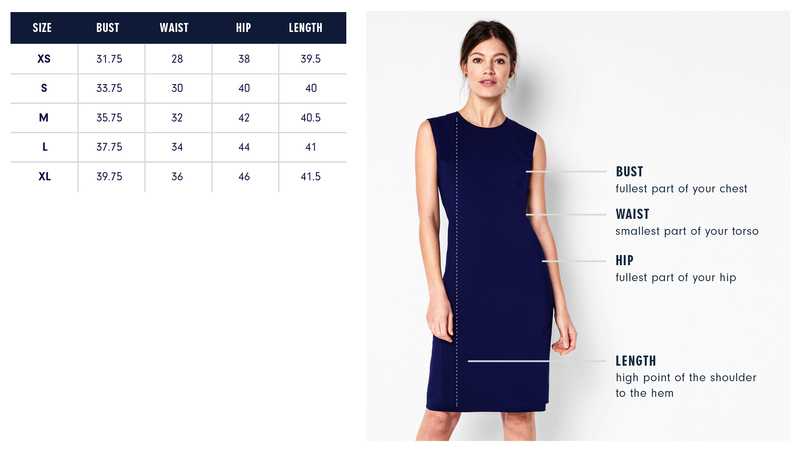 Our model is 5’10 ½” and wearing a size S.
Below are the exact measurements of the Baxter Dress. All measurements are in inches. For general brand fit, sizing, and measurements, please visit our Brand Fit & Size Guide. A-line silhouette with long sleeves and figure elongating asymmetric seams. Fitted through the bodice and flares smoothly at the hip. Elegant knee length. The athleisure trend inspired me when designing this dress. The textured fabric is reminiscent of sportswear and I really wanted to elevate that theme to a place where it was work appropriate.